Portable Surveyor has many ways to look at network traffic, from utilization graphs to protocol distribution. 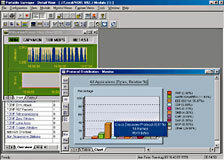 The net analyzer is easily configurable. The Portable Surveyor from Shomiti Systems acts as a network psychotherapist. Not only does it analyze LANs, it makes house calls. LAN analyzers come in two types, each with strengths and weaknesses. Some are software-only packages, some are special hardware devices, and a few such as Portable Surveyor combine both approaches. Portable Surveyor's CardBus PC Card network interface card works with any compatible notebook PC. The card feeds packet data to Shomiti's Surveyor software for analysis and display. Like a good therapist, Portable Surveyor helps you find the effects of problems and drill down to root causes. Even better than a therapist, the software can trigger an alarm while a situation is still developing. Alarms are modifiable for specific environments'a good way to reduce false incident reports and improve detection of real-life troubles. Whether the problem is in the media access control layer or network layer or in the application response lag, Portable Surveyor can be configured to report on it. It makes a great tool for field support personnel who carry notebook PCs. One glitch, however, is that the CardBus NIC cannot simultaneously provide normal network access while capturing packets. When I tried this, I either got horrible performance or lost the network connection. But the proprietary PC Card NIC's packet-capturing performance was exceptional. Though not as robust as the full-line-rate capture cards in hardware-only analyzers, Portable Surveyor has better portability and a lower price. It can even analyze and troubleshoot virtual LAN environments. When I connected older versions of the Portable Surveyor NIC directly to a switch, I did experience some problems, but the current version gave none. As a good counselor knows, collecting and analyzing as much data as possible is the key to successful diagnosis. Portable Surveyor's ability to collect network traffic statistics from the hardware level all the way up to the application layer, and to analyze that data for trouble, makes it useful throughout an enterprise environment. The Expert analysis tools keep an eye on the most common network errors and put them into an easily viewed report window. Some error reports let the user drill down to a specific incident and see recommended solutions. Like other analyzers, Portable Surveyor can clutter its interface rapidly with multiple charts. If a particular NIC is having an identity crisis, or if your virtual environment has given your switch multiple personalities, make an appointment for a counseling session with Portable Surveyor.